1) Fourth floor, very private, great breezes. Lanai and condo opens to the beautiful, blue pacific. Three lounge chairs on the lanai with pull out leg rests. 2) Fabulous views of the Pacific with turtles swimming in the water below and surfers "hanging ten". The building is about twenty five feet from the water's edge with a lush carpet of green along the water's edge. 3) From the kitchen, dining and living room areas there is an unobstructive view of the water....listening to the roar of the waves is "hypnotic". 4) Newly remodeled kitchen, living, dining room,bedroom and bath are nicely remodeled and very comfortable. New paint and bedroom furniture as of May 2017, with porcelain tile floors to match the rest of the condo. 5) The condo sleeps four with two queen beds; (one in bedroom and the second in a closet in front room, very comfortable, murphy bed). 6) Ceiling fans: dining room, living room, bedroom and bath. 8) Two TVs with DVD players. (LR and bedroom). CD player in living room with cable to connect Iphone or other audio source. 9) Fully equipped electric kitchen; (Pots/pans and everything to cook with and relax at home). 14) Two elevators in main lobby of building very convenient to our condo, also four stairways in building. 18) Luggage carts - Carts are available in the lobby for luggage, etc;. (If not in lobby, they will be returned shortly as one is being used by a guest). Goggle - "Kauai calender" or "Things to do Kauai" and some great info will come up on the Internet. Kuhio Shores is a wonderful place to stay, especially where we were, on the top (4th) floor, in #411. Apart from a few items that would have been useful, e.g. 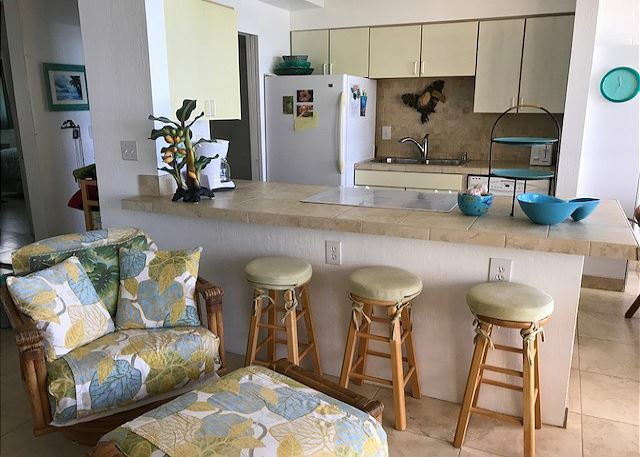 : spoons larger than teaspoons, some basic supplies such as aluminium foil, cling wrap, olive oil, soy sauce, etc., the condo was very well-stocked, with everything you could need for a beachside vacation. 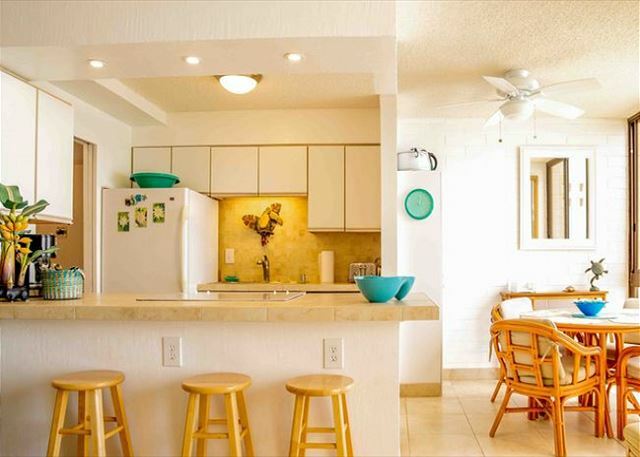 It's in a great location in sunny Poipu, close to very good restaurants and shopping. The property is well-maintained and managed., though the unit itself could have been cleaner - some oversights by housekeeping, perhaps? The property management company was very good about supplying the items that were missing, and prompt in replacing the phone that died. The views of the ocean are fabulous, and we had front-seat viewing of turtles every day. There is very good snorkelling on either side of the building. 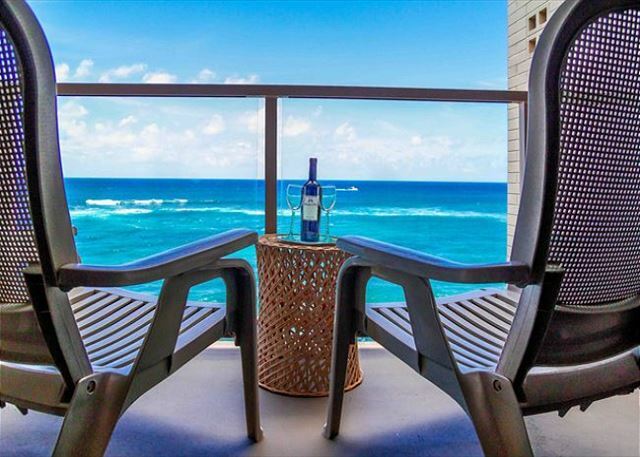 Kuhio Shores 411 has an absolutely incredible view of the ocean. It’s 4th floor central location in Kuhio Shores is the best spot for seeing turtles. We could see whales breaching and tail slapping without even using binoculars. The sunset view from the lawn at the corner of the condo complex is simply outstanding. And some of the best snorkeling on the island is right in front of and to the right of the condo. The condo itself has a very comfortable bed in the bedroom, and also a Murphy bed in the living room. The kitchen is very well-stocked with glassware, dishes, and everything you need to cook. The condo provides a huge amount of snorkeling equipment, as well as beach chairs, umbrella, boogie boards, etc. The management company was professional, and did the best they could with trying to replace the broken dishwasher. There should be a new dishwasher by now. The only improvements needed in the condo are in the linens and living room furniture, which are quite old. Overall, this was a great condo, and we really enjoyed staying here. My time at Kuhio Shores i Kauai was healing, renewing, and fabulous. Spacious 1 beedroom with AC. Good location with beach and restaurant nearby. Well equiped with a homelike feeling. Watch turtles while having your breakfast. Less rain than the east or north Kauai. We had an amazing stay at Kuhio Shores #411. Perfect accommodations, great location. The Most Beautiful Vacation Spot in Kauai! We cannot say enough good things about our experience staying at Kuhio Shores #411. From our first communication with Wendy (the owner) and Mike (from the rental company) we were met with friendly and timely answers to all of our questions. Wendy, even sent us some tips about places to explore during our trip, and Mike made sure we knew to pick up the condo key at the airport from the car rental so we didn't have to make another stop at the rental office. Super helpful. The condo was even more beautiful and homey than the pictures and description. It's sort of unreal how close you are to the waterfront and how well stocked the condo is! There were fresh towels (for beach and bath), all kinds of cooking utensils, pots and pans, and even a blender. The closets are also full of clean snorkel gear and fins (perfect for use in the little inlet next to the restaurant about 200 feet away) - and even some sun block! And the price can't be beat! It was cheaper than many of the non-ocean facing rooms in the nearby hotels. So quiet and relaxing. We spent every morning on the lanai drinking coffee and watching sea turtles (and surfers) bob up and down in the breakers. I have never been to a more beautiful place! Thanks Wendy for opening your condo to us - and for giving us such a wonderful place to rest and relax during our first trip to Kauai! We couldn't have dreamed of anything more lovely and we are telling all of our friends! 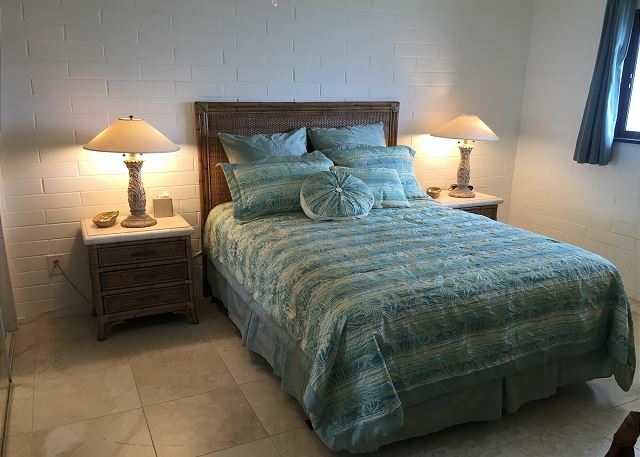 Kuhio Shores unit 411 is a one bedroom, well-maintained, top floor comfortable and wonderful place to stay in Poipu. The unit has all the amenities you might need for a short or long stay. 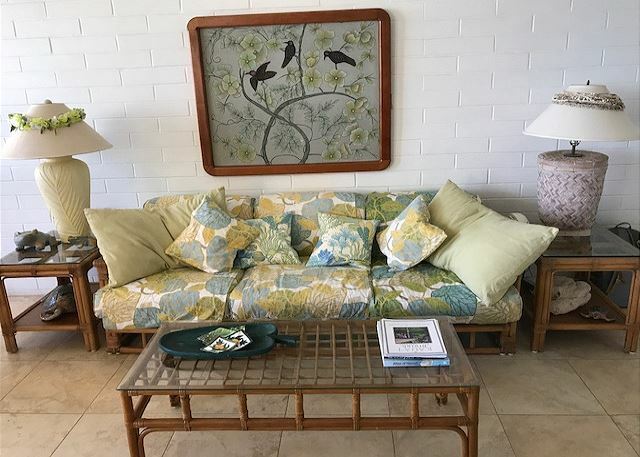 Pleasures include watching for turtles and dolphins from your top floor lanai while you sip your morning coffee and catching the sunset on a lovely grass lawn to watch surfers right in front of you as you sip your favorite beverage. Meet visitors and locals gathering in front of the Beach House Restaurant, a short walk away. 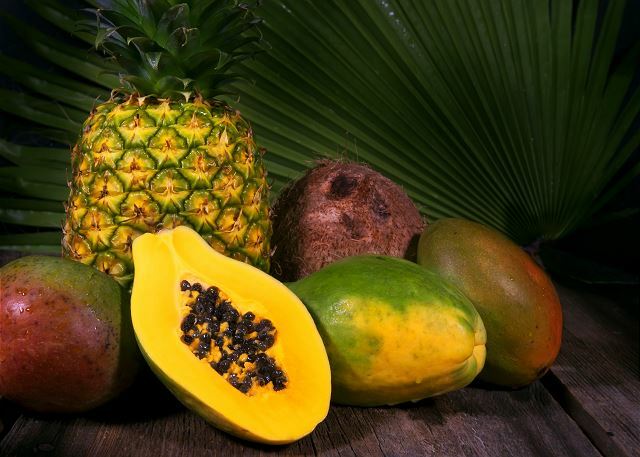 Walk or drive to many sights nearby including the famous Spouting Horn or National Tropical Botanical Garden, Poipu Beach and several golf courses. The location is ideal and the accommodations are perfect for a memorable stay on Kauai's south shore. We enjoyed the well cared for condo with such a spectacular lanai view and so many beach amenities! Also loved the area right around the condo with beautiful sunsets, the Spouting Horn and Poipu Beach with fantastic snorkeling!! This is our 2nd time to stay in unit 411 at Kuhio Shores. 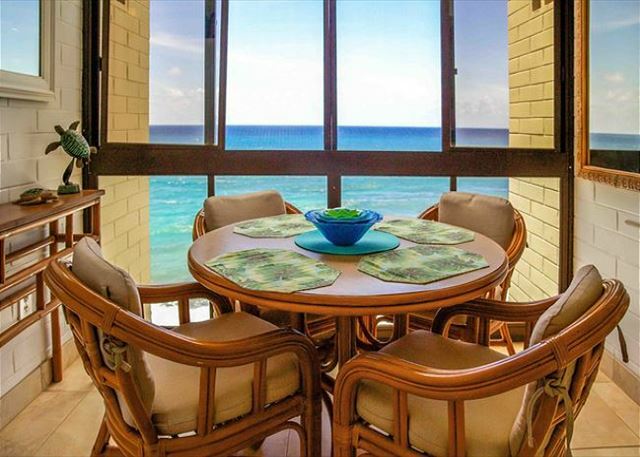 We love being on the top floor with a beautiful view of the ocean in addition to the privacy. This unit is super clean, and the ease of rental is convenient. The best part for us is the Murphy bed in the living room so we can hear the ocean all night! Excellent location. Great condo well stocked with everything you would need for the beach. Would definitely stay here again. Walking distance for shopping, snorkelling, dining and beach. Sunny side of Kauai. Watch turtles and whales from lanai. We had a lovely stay. Everything is laid our perfectly to inform and guide the guest. All easy and comfortable. Lovely condo right on the ocean. So well stocked, had everything we needed. Clean, well kept, and comfortable. We spent a lot of restful time on the lanai enjoying the view. Greeted with fresh fruit - nice surprise after a long airport day. Easy booking with Mike. Hope to return - really great place! Very nice place to stay. Awesome view of the ocean. Everything was straight forward. No problems. Smooth transaction. Place was very clean and comfortable. All arrangements went as planned and without hassle. The condo is lovely and has pretty much ‘everything’ you need. Beach chairs, towels, hats, sunscreen, bug spray, noodles, and more. The kitchen had all the dishes/pans you could possibly use. For anyone who has never stayed at Kuhio Shores - well the view is to die for. Also! If you are going to have 4 people in a 1bedroom, the Murphy bed is 1000% better than a hide-a-bed. The A/C units are new and I realize seriously after-market, and although I have never noticed a need for it before, it was nice to cool the place a bit in the afternoon. However, they are a bit noisy. Nothing heinous, just a bit.